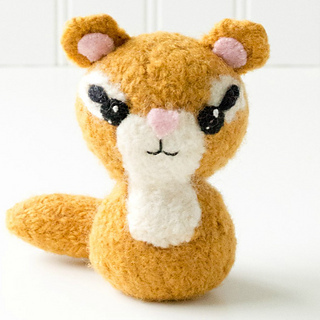 Finished Size: Approximately 3-1/2 to 4 inches (8.9-10.2cm) tall, depending on yarn used and amount of felting. 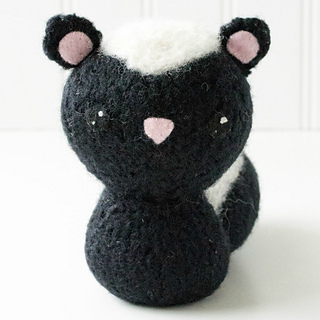 Skunk: Black (46yd/42m); White (10yd/9.5m). 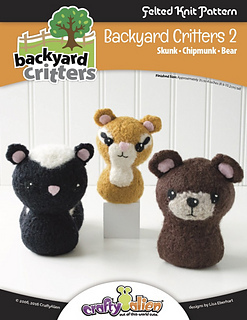 Chipmunk: Gold (30yd/27.5m); White (6yd/5.5m); Black (2yd/2m). 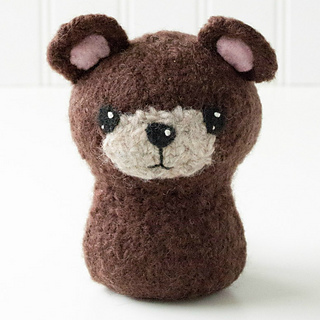 Bear: Brown (36yd/33m); Natural (2yd/2m). Needles: Straight needles, size 10 US (6mm). Embroidery floss: black, pink, white (All). Small amount of waste cotton yarn to temporarily secure seams. Stitches: M1 (Make one), K2TOG.